I don’t think I’m going too far out on a limb in making the following sweeping statements about a certain book that I just read, A.M. Stanley’s Tomorrow’s Yesterday: You have never heard of this book, or of its author. You’ve never read anything about the book, either in print or online. This, my friends, is a lost book; one that, since its initial publication in 1949, has plummeted stone-like to the bottom of the literary pool. Not just a book that is currently out of print but is easily researchable ― there are tens of thousands of those ― but rather, a book for which virtually no information is to be had at all. Even the usually infallible Internet Speculative Fiction Database offers no help when it comes to this volume, and indeed, I do believe that this review here may well constitute the only substantive words to be found regarding this novel on the entire Interwebs! (My contribution to mankind!) To be fair, The Science Fiction Encyclopedia does offer us a one-sentence description of the author and what would seem to be his only published work, but other than that there is nothing. So how, you might well wonder, did I manage to acquaint myself with such an obscure novel, which, outside of the 1949 Dorrance & Co. hardcover, has not been reprinted since? Well, it all happened at NYC bookstore extraordinaire The Strand, where I first noticed the volume sitting on its shelf. 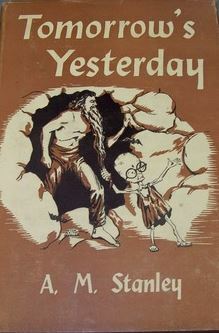 The cover, by one Evan Keith Boward, was eye-catching: a bare-chested man, with a beard hanging below his waist, being led out of a cave by a diminutive, gnomelike being with an oversized head, humongous Elton John goggles, and anorectic arms and legs. The book was still there the next time I visited, and the time after that, and indeed, months later. “Heck,” I finally said to myself, “if nobody wants to buy this book, for $6.50, I’ll give it a shot.” And so the volume was purchased, only to sit on my shelf at home, unread, for a number of years. Finally, though, I have given Tomorrow’s Yesterday a long overdue read, and thus am able to at long last comment on A.M. (Alfred Mortimer, the dustcover reveals) Stanley’s sole piece of fiction. Coincidentally, this is the third book in a row that I’ve read featuring what I suppose we might call a “sleeper” character: a Rip van Winkle type who is rendered unconscious and awakes in a far-distant age. In Stanley G. Weinbaum’s The Black Flame (1948), electrocution was the cause of the suspended animation; in Philip Francis Nowlan’s Armageddon 2419 A.D. (1928), radioactive gas following a cave collapse. Here, the cause goes unexplained, until the book’s twist ending. All we know is that after archeologist John Evering is trapped in a cave-in while exploring an Arizona cliff dwelling, he loses consciousness and awakes to find himself in an utterly changed land, a full millennium in the future! The desert has been transformed into a lush garden, and the U.S. is now run by those diminutive gnome creatures previously mentioned. Evering soon learns that the year is currently 929; that is, 929 years since a wildfire ― born of altered climate, itself the result of atomic radiation ― had scorched most of the North American continent. Our hero, sporting a 1,000-year shadow on his face, spends the rest of Stanley’s book being shown around by, and arguing and debating with, Bella, his guide (as it turns out, these gnomes, a physically degenerate, mentally superior lot who had migrated here from what we must assume was northeast Canada, are ruled by their women; to my amazement, that gnome on the book’s cover is meant to be female!). The two bicker over each age’s supposed accomplishments and failures. But Evering still has one more surprise in store before all is said and done. …why could they not see the uselessness and waste of war? The wars they waged only depleted the supply of food, shelter, clothing, and security they all desired. War defeated the ends to which all people aspired. Why could your race not see this? Evering, of course, is forced to agree. Bella also lets it be known that his people are always trying to attain the perfection of Jesus Christ, at the same time telling John that Christ probably never existed, except as a parable. Somehow, the reader senses that these are Stanley’s feelings, too; that the Bible is an “allegory of history [whose] writings concealed rather than revealed.” Family life as we know it in the 20th century has been done away with by Bella’s people, it being felt that the State is more capable of child rearing than overly-emotional and overworked parents, and so Evering/Stanley endeavors to explain how bad an idea that is, and admits that the seeds of such a mistake were indeed present in the mid-20th century. Evering also discusses how overly generous the U.S. is being, via its Marshall Plan (yes, the book is assuredly dated in parts), to a world that is taking advantage of it. And when Bella and her people mistakenly (and comically) identify a 1,000-year-old bank for a church, a Mormon temple for a slaughterhouse, a billboard for a prayer wall, and a football stadium for a holy place, Evering is forced to wonder how very off his own conclusions as an archeologist might be concerning those Arizona cliff dwellers. It is all interesting and lively discussion, and Stanley serves it up reasonably well. The book also sports several instances of faulty grammar (such as when we learn that the gnomes “spoke jerky,” instead of “jerkily,” and when Stanley writes “…your inventions and political life has modified the need of the church,” rather than “have modified”). And then there is the little matter of misspellings in this Dorrance publication. Note that I did not say “typos,” as one gets the feeling, by the oft-repeated nature of these misspellings, that they are deliberate; an egregious collection of errors by both Stanley and his editors. Thus, “clambered” is repeatedly spelled “clamored” (another word entirely, right? ), “distract” becomes “detract” (ditto), “detestable” is spelled “detestible” (not an alternate spelling), “free rein” becomes “free reign,” “catastrophe” is “catastrophy,” “gimcracks” morphs into “jim-cracks,” “affected” becomes “effected” (a common mistake, granted), “deity” is “diety,” “statue” becomes “statute,” “dais” is “diaz,” “colossal” somehow winds up as “collosial” (aaaarrrgghh! ), and “disastrous” is “disasterous.” It is all very odd; a case of an oddball hardcover making an oddball novel even odder. I leave it up to you to decide whether you’d like to pay the asking price that I’ve seen on various websites for this little literary obscurity. For $6.50, it was a steal for me, and I have no regrets about having bought it and then reading it. No book, I feel, should sink into the utter oblivion that Tomorrow’s Yesterday has sunk into. It is a decidedly minor work by what seems a talented yet likable novice, but still, one worthy of a long-overdue second printing. Like Evering in that cave with his Indian petroglyphs, I was very happy to have unearthed this one.